LIINES played their biggest headline show to date at the Deaf Institute and what a triumph it turned out to be. 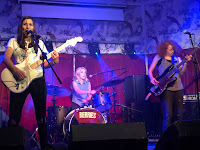 Three hundred or so like-minded souls, lovers of music, were joined together by the rapid-fire, raw sound of Zoe, Leila and Tamsin and their album Stop-Start and some new songs that suggest their star is set to rise further. Support came from London's Berries and Manchester's Threads. Threads open up proceedings with a powerful energetic set based around their Chemtrails EP. 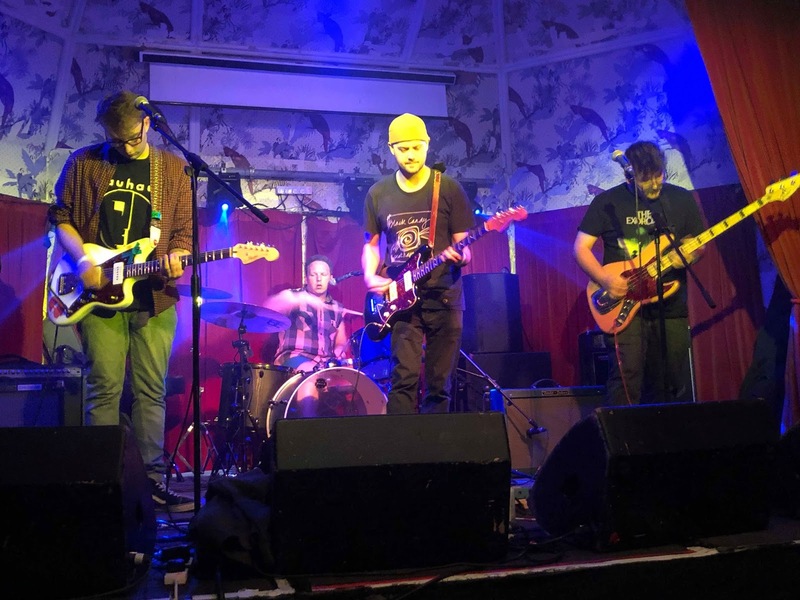 Musically they're urgent, unable to let a tune stand still for more than a few seconds and there's a whole mish-mash of influences at play, often fighting for space, that go down well with the growing crowd. 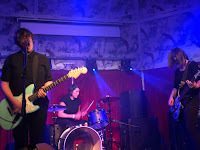 Ash, George and Kane share vocals, each with their own style, which sometimes brings the songs into conflict, but all of them agitated and restless like the music they're creating. They've got plenty of rough and sharp edges that they don't seem to care about, and neither do most of the crowd who give them a great reception. Berries are most definitely a band on the up. Already at a level where they can sell out venues close to this size in London, they seem to have made an impact up here too and tonight they win over a whole new load of admirers. 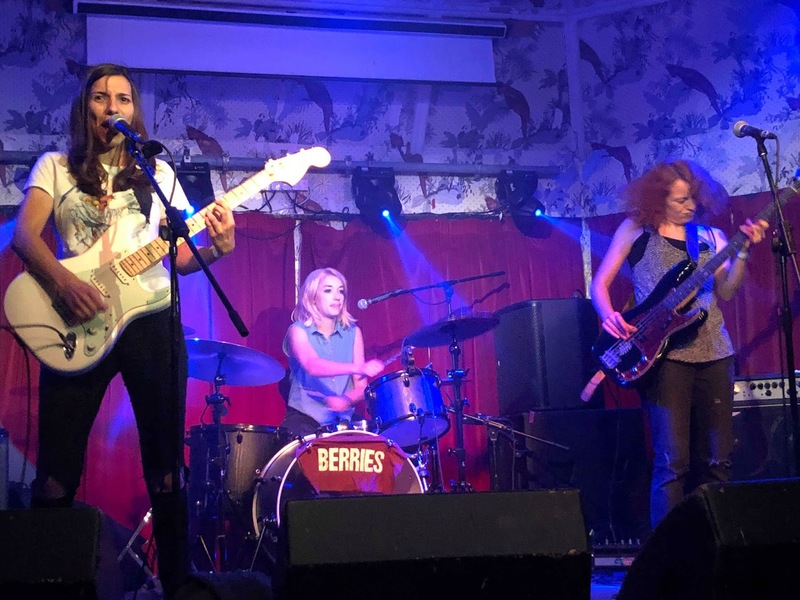 They call LIINES heroes towards the end of the set, rightly for reasons we'll elaborate on later, but Berries have a more melodic edge to songs like Faults, Stormy and Waiting that might serve them well on radio as they grow. They open with Sirens from their debut Those Funny Things EP and it's a masterstroke as the ears of the attentive crowd are pricked up by the immediate hook of the song and by the end they've got them eating out of the palms of their hands. There's a real joy in watching Berries perform that's contagious and it's been a long time since we've heard such a strong reception for a support band in the Deaf Institute, let alone one that's travelled a couple of hundred miles and weren't known to many of the audience before they started playing. 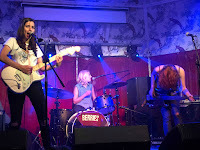 Whether it being Holly or Lauren's high-energy guitar and bass playing and Lucie's drumming that looks effortless until you actually hear what she's playing, you can't help but be drawn in. 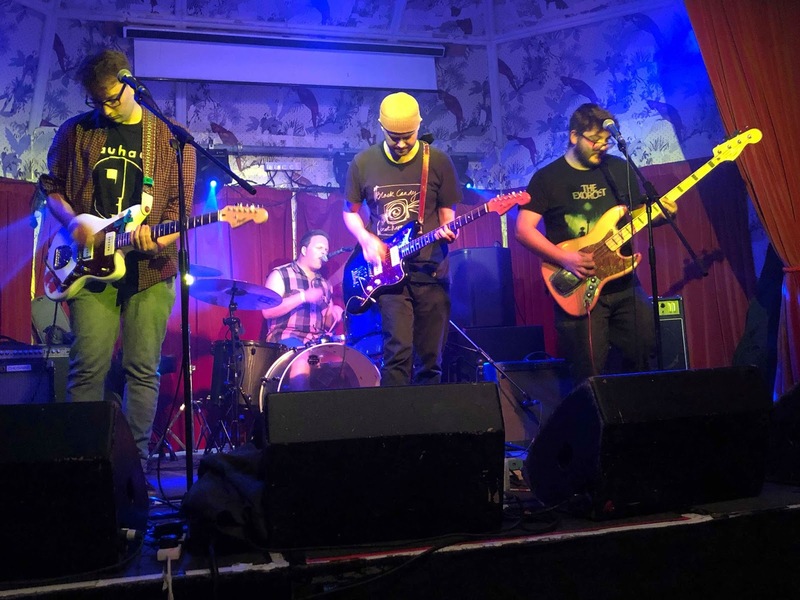 They debut a brand new song and it feels like it's like a progression straight away, the sort of thing that you know is the sign of a band heading for bigger things. It's LIINES night though. Of that there is no doubt. There's a real buzz of anticipation as they make their way on to the stage, the sort that says we're about to experience a really special night. We've seen them grow from playing to six people opening up a fanzine launch just before Christmas in 2014 to this. Between songs tonight the roar is so loud that this modest unassuming band have to stop and not go straight into the next song as they are accustomed to doing, for fear of Zoe collapsing in giggles of excitement. Whilst they might not quite believe it, this success is so richly deserved, they tick none of the non-musical boxes that you have to these days to get a shot at bigger things, but the music does their bidding for them and that's more powerful than a garish outfit, a fashionable hair cut, a colourful video, an excitable and fake social media presence and whatever other gimmicks bands try these days to make themselves stand out. 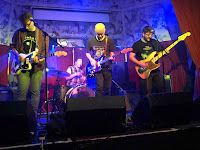 LIINES turn up, plug in and play these magnificent sub three minute songs that threaten to knock you, and Zoe at times, out and show that there's still a market for this if you can get heard. Whilst Zoe looks like she's about to expire at any moment by the time the forty-five minute rollercoaster returns to its docking station, Tamsin exudes an effortless cool, unflustered by the heat or the reaction, whilst Leila's drumming, so critical to the pace and direction of these songs, manages to dictate everything in a regimented way that yet still allows the primitive tribal energy of LIINES to shine through. There is no show in these songs, no unnecessary sections of songs, they aim for the jugular from the start and don't let go till they've ripped your throat out. As it's effectively the delayed launch gig for Stop-Start, we get all ten tracks from the album and whilst the singles get the best reception, as the casual fans become die-hards as the set progresses, it's the power of the whole, including the new songs, that make this gig such an unforgettable night. 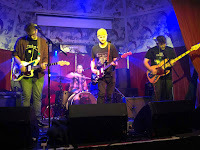 The likes of Blackout, Be Here, Disappear and the main set closer Never There, the song with which they announced themselves in 2015, go down a storm with the appreciative crowd and that love from floor to stage is reciprocated. 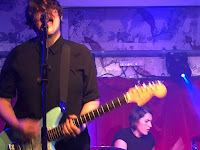 The new songs are treated like old friends - Sorry making its first appearance and showing that whilst the loss of Steph and Tamsin joining has of course changed the band, it hasn't diluted their ability to create songs that hit you hard in a way that will set you reeling. They finish the night with I'm Not Afraid Of You, a one-line repetition throughout, that's so simple yet brilliant in its execution that you'll forgive its lack of a verse and chorus. There's something magical about watching a band grow and grow with the odds stacked against them, where the usual rules for a band to get a break are torn up and thrown in the bin. 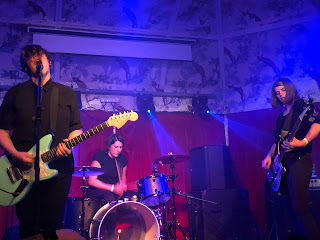 Manchester seems to be home to a few of those bands at present, the ones that are so damn good that all they need is for someone to give them the time of day. LIINES sit up there at the top of that pile, their ability to take just guitar, bass, drums and Zoe's voice, which tonight has people gasping at its power, reminding the crowd of why they fell in love with music in the first place. For all the use of the word "proper" to describe music like some sort of mystical crown, this feels like that adjective is appropriate for LIINES, because their music comes first, second and every position until last. We interviewed them last week ahead of the show - read it here. 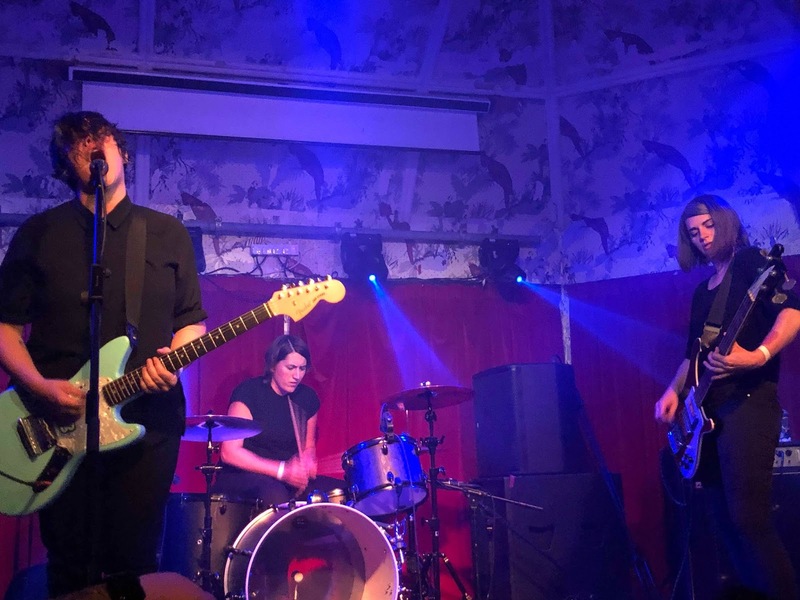 They play Nottingham Rough Trade (August 1), London Brixton Windmill (18) and Ramsbottom Head For The Hills Festival (September 14).